Grew up… in the Southern Air Temple. Aang was a young monk, learning the ability to manipulate air – called airbending – and enjoying fun and games with his friends. But when he was twelve, he learned that he was the Avatar: the peacekeeper of the world, with the ability to bend all four elements, and the responsibility to bridge the physical and spiritual world. In a panic, he fled during a storm, and disappeared. Living… one hundred years later. Aang and his flying bison Appa were suspended in an iceberg, where they slumbered for a century. Now two Water Tribe members, Katara and Sokka, have woken him again. Profession… Avatar. Aang has woken up to find that the Fire Nation has started a war against all the other nations in a bid to take over the world. 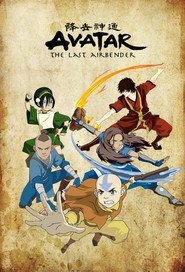 As Avatar, it’s Aang’s job to keep the balance between all the elements, and that includes all the kingdoms. He has to stop Fire Lord Ozai from taking over. Interests… having fun. Aang has a serious job, but he prefers to spend time flying around with Appa, or sliding around on the ice. He’s always full of invented games and ways to avoid serious topics. Relationship Status… single. He has kind of a thing for Katara, but she has yet to notice. Maybe it’s because she’s taller than him. Challenge… learning how to bend all four elements, and defeating the Fire Nation. Aang is already a good airbender, but he has to learn waterbending, earthbending, and firebending if he’s going to have the strength to battle the entire Fire Nation. If that wasn’t enough, he also has to deal with the loss of all his friends and family, since he’s been asleep for a century. Personality… playful, peaceful, and determined. Aang doesn’t like fighting and he’s afraid that he’s not up to the task of being Avatar. But he knows he doesn’t have a choice, because he’s unwilling to let people suffer under Fire Nation rule if he can do anything about it. Still, if none of this was happening, Aang would rather be swimming. Aang's popularity ranking on CharacTour is #41 out of 5,000+ characters. See our top-ranked characters and read their profiles.